Please refer to our stock # 3423 when inquiring. 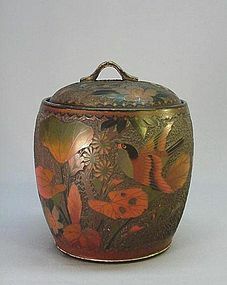 This is a rare Meiji period Japanese tree bark cloisonné jar. It is cloisonné design over ceramic body which was made to look like tree bark. It is 7” tall and 5 ½” at its widest part. It has a flower, bird and butterfly design over its brown body. It is in great condition, a little color rubbed off of the rim and base.